In this article, I would like to talk a little bit about LEDs, including why they will become the lighting source of choice, how to power them and also, how to protect them from the hazards they face within their respective implementations. These include high bay lighting, architectural lighting, outdoor street lighting and even 75W incandescent bulb replacement. Why use LEDs in the first place? They cost more than incandescent lighting by a factor of 13 to 1, so what benefits make them so appealing? What do LEDs need to power them? It’s not like you can just screw-in an LED into an existing incandescent light fixture! So what has to be done to correctly house and power them? 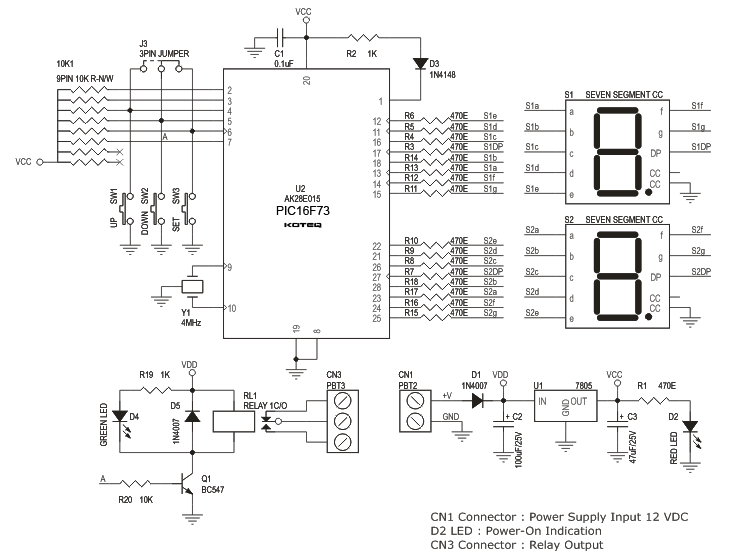 What negatively impacts an LED and its LED driver circuit? LEDs are not a “heater” like an incandescent bulb, which is essentially a resistor, they are essentially a diode. As such, they need a fairly tightly regulated current and voltage, which is generally provided by an LED driver circuit. However, this circuit is susceptible to open or short circuit conditions – so care must be taken during the design process to protect against potential occurrences. Also, high temperatures negatively impact an LEDs useful light output, so care must be taken when designing both their driver circuit and its housing. Unlike an incandescent bulb which can take an AC mains voltage directly, an LED needs a regulated DC voltage and current. As a result, AC to DC conversion may be necessary depending in the power source. Whenever a conversion process takes place there is always the potential for things to go wrong. In many cases these event can potentially harm, or even kill the LED driver circuit – and without it, the LEDs cannot light themselves! Therefore it is necessary to provide the LED driver circuit with protection from such occurrences. As a result, it would be helpful if driver ICs had LED protection incorporated within them. 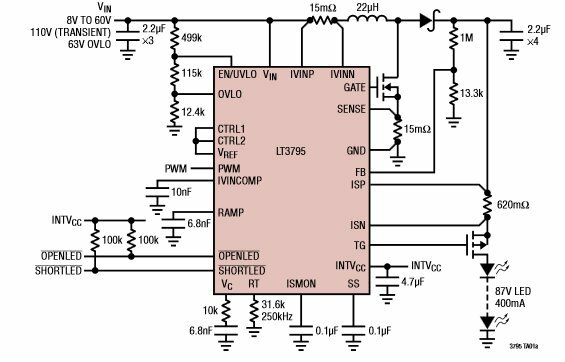 Later in this article I will provide you with some examples of LED driver ICs with protection features built into them so that a long and useful life of LEDs can be attained. One of the features of an LED is its Efficacy. At 80 lumens per watt of light output it is at least 8 times more power efficient than the incandescent bulb. Or, put another way, it uses one eighth of the electrical power of an incandescent bulb to attain the same light output. This equates to energy cost savings over the life of the installation. Looking at the lifespan in this table, you can see that an LED can last at least 50 times longer than its incandescent counterpart. Therefore, there is a point at which the higher initial cost of the LED bulb is offset by its reduced energy costs. For illustration purposes, by simply replacing the five most used light bulbs in the average home, these energy cost savings can be realized in less than a year. Of course, there are other benefits to using LEDs, such as they contain no toxic material and they have no failure modes – provided that their power supply is designed to power and protect it correctly! As already mentioned, an LED is the electrical equivalent of a diode. As such it is a current driven device; therefore, by simply applying the correct amount of current through the LED will allow it to attain its specified light output in lumens per watt. Correspondingly, supplying less current will limit the amount of light output that it is capable of delivering. For a single LED this might not seem like a big deal; however, if there are many LED in a series string, and they are not getting uniform current, the light output will vary greatly and be very noticeable. Of course, you also have to overcome an LEDs inherent forward voltage drop, which can vary depending on the type of LED you have and the end fixture configuration. For a typical white LED this forward voltage drop is usually around 3.5V but can be slightly higher at elevated temperatures. As a result, depending the input power source, a wide range of conversion topologies will probably be needed. This can be further complicated by the different LED string configurations, which include series (LED forward voltage drop additive), parallel (LED current additive) or a combination of series and parallel strings (both LED forward voltage and current additive). Alright, we have now covered what an LED needs for correct operation, but what can happened to negatively impact their operation and that of its driver circuit? Well, the answer is that a lot of things can adversely affect an LEDs output, or even lead to its catastrophic failure. These events consists of over voltage, usually occurring during an open LED event, or an over current condition which normally happens during short circuits or the re-plugging of an LED String. Of course, as previously mentioned, poor thermal environments can also adversely affect an LEDs useful life and so a good overall thermal designs is critical too. Also, lest we forget, once again the LED driver circuit is also important, and so it is equally imperative that care be taken on its design such that it can protect itself, and therefore the LED, from opens, shorts and poor thermal environments. By the way, all of these issues are commonly found in most automotive, avionic and industrial environments. A critical aspect of powering an LED is the correct delivery of a tightly regulated current. It is here that the LED driver circuit is key since it must take whatever the input power source is (which will vary widely due to the broad range of applications), and convert it to the required voltage and current levels which best optimize the LEDs performance. Since over voltage or current can negatively impact either LED life or its light output over time, the tighter they can be regulated the more robust the system will be. Therefore, having +/-5% voltage and current regulation will be beneficial for long and trouble free operating life. Another key criterion is to provide over-voltage protection. Therefore, an LED driver circuit which can handle higher transient voltage conditions above those required for normal operation is a pre-requisite. A good example of this is in an automotive environment where load dump might be 42V, or even higher. Protecting LEDs from thermal overstress is a little more challenging. Quite often the LED deployment fixture is small and compact with very little in the way of heat sinking – and probably no fans to provide air cooling. Therefore, most to the heat will have to be dealt with via conduction. As a result, good heat sinking must be taken into account at the design stage. Also, having an LED driver circuit that operates with a very high conversion efficiency is a great help here since with higher the conversion efficiency, less heat is produced as part of the conversion power losses. Thus, LED drivers with low to mid-90% efficiencies will significantly aid good thermal design. Another interesting way to help with thermals is to have an on-chip temp sensor as part of the LED driver circuit such that if there is a system microcontroller to monitor this temperature signal, it could can the overall system throttle back the current so as to allow less heat generation. Of course, this would be at the cost of reduced light output, but this is better than a complete system failure. Once the fault condition goes away, normal operation could resume.